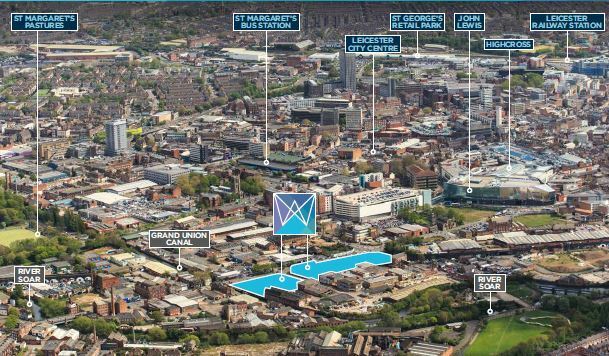 An exciting new city centre office scheme fronting the A50. Within walking distance of Highcross, public transport and city centre amenities. Adjacent to the recently completed Friars Mill Waterside business hub. High specification Grade A self contained new build offices from 2000 sq ft upwards (up to 30,000 sq ft) with dedicated parking. Part of a comprehensive mixed use development scheme to include high quality residential, commercial, retail and leisure space. Bounded by the Grand Union Canal offering landscaped scenic open spaces, footpaths and cycleways. Significant off site investment to include Highway and street scene improvements. Enterprise Zone status - 5 year Business rate exemption for new occupiers. To be made available for inspection upon request.